I've been stuck behind the loom for the last few days, because weaving the blue-green fabric turned out much more difficult and time consuming than my previous project. The yarn seems to be more fuzzy and the threads catch each other all the time and don't want to be lifted or lowered with a heddle easily, so I have to separate them with my fingers all the time. Whew... But I hope to finish it today, so photos tomorrow. (yes, because it's a frugal cooking recipe! ^^). No need for a mixer for this recipe. Preheat the oven to 350°F. With a wooden spoon, mix butter into the mashed bananas in a large mixing bowl. Mix in the sugar, egg, and vanilla. Sprinkle the baking soda and salt over the mixture and mix in. Add the flour last, mix. Pour mixture into a buttered 4x8 inch loaf pan. Bake for 1 hour. Cool on a rack. Remove from pan and slice to serve. 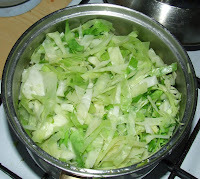 Pour the water into the pan, add salt and a shredded cabbage. Bring it to boil, then simmer on a very low heat for about 1 hour stirring occasionally. At the end, when the cabbage is soft, add dill and some salt to your taste if necessary. Serve with cooked young potatoes and pork chops or roasted chicken. 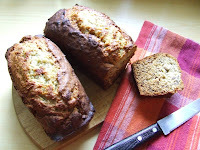 yummm, your banana bread looks very good. I love making banana bread. Pumpkin bread is made the same way and I like that too. I just love to cook.